The Democratic Party establishment continues to tilt the nomination battle in Clinton’s favor. First they gave in to her request to limit debates. They helped her out in Iowa by not releasing the popular vote, as has been done in the past, as Sanders was very likely the winner. When they realized that Clinton did not have an advantage over Sanders in fund raising, the DNC helped her out by relaxing the restrictions Obama had imposed on contributions from lobbyists. If this doesn’t work, there are the super delegates. Saturday may well be the day that altered the course of the Democratic presidential race, when Hillary Clinton blunted Bernie Sanders’ campaign, when she was forced to work as hard as she ever has for a week (with a little help from a lot of friends) and slingshotted her with new momentum into South Carolina and then Super Tuesday. Nevada may indeed prove to be the day that saved Hillary Clinton’s campaign. But the caucus, which Clinton won by about 5 percentage points, also cemented Prince Harry as a man Machiavelli would have bowed to, a man who with one eye who still sees the field better and is still more dangerous, effective and cunning as any pol the state (the country?) has ever seen. Clinton may not have won Nevada if Reid had not interceded last week when the man feigning neutrality saw what everyone in the Democratic elite saw: Sanders erasing a once mountainous lead and on the verge of perhaps winning Nevada and rendering inoperative the “Hillary is more electable” argument. 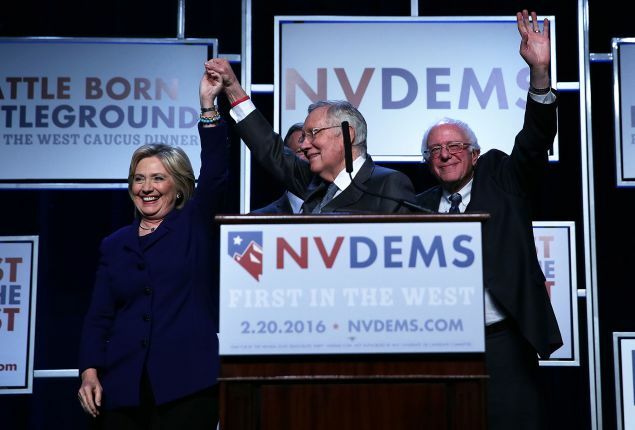 The story of the Nevada caucus is that a lame-duck senator and a self-neutered union conspired to revive the Clinton campaign in a remarkable bit of backroom maneuvering that helped Madame Secretary crush Sanders in Clark County, the key to winning almost any statewide election. Combined with a Clinton machine, erected last spring and looking invincible, that suddenly had to scrape the rust off its gears and turn out her voters, Caucus Day also was a remarkable story of an indomitable candidate, her nonpareil Nevada staff and a ragtag but committed Sanders operation that made them sweat. But, ultimately, what turned this race was Reid, who clearly came home to find that Clinton’s insurmountable lead was being surmounted. Despite being furious with Team Clinton for its panic-stricken spin that Nevada was as white as Iowa and New Hampshire, undermining Reid’s argument why the state was given early-state status (and, you know, being false, too), the senator decided he would single-handedly save the state for Clinton. In the middle of last week, Reid made a phone call, first reported by The New York Times’ Amy Chozick, to D. Taylor, the head of the parent of the Culinary Union local in Las Vegas. Before that call, the Culinary, facing difficult contract negotiations and seeing no advantage in enmeshing itself in a bloody internecine fight, had declared it was more Swiss than Hispanic. With the Culinary not endorsing and unwilling to even engage in the caucus, turnout at six casino sites on the Las Vegas Strip was forecast at a combined 100 or so. That is, insignificant. Despite their common public neutrality, Taylor and Reid surely believe, as do most Democratic power brokers, that a Sanders nomination would be a disaster. Reid knew that Taylor would get his swarms of organizers to turn out mostly Latino workers, who would likely vote for Clinton. A gamble? Yes. But like going all-in with a straight flush. This changed the whole narrative of the race. Imagine how different things would be if it was first reported that Sanders won the popular vote in Iowa, he had his landslide victory in New Hampshire, and then had a win in Nevada. It is still premature to write off Sanders. Clinton won the Nevada caucus by approximately the same margin she won eight years ago, and that certainly did not prevent Obama from winning the nomination. Far less shenanigans can occur in a primary as opposed to a caucus. Plus young voters, who did not turn out as expected in Nevada, might be more willing to cast a vote in a primary as opposed to going through a more difficult caucus session. If nothing else, this might have reinforced the need for everyone to turn out to vote. Sander does also need to improve his vote among Africa Americans, but should do better when more northern states are voting. Still, there is the danger that many people will vote for the winner without fully considering the candidates, and all the hype of Clinton winning big in Nevada could provide her with momentum. If that is the case, she might be able to thank Harry Reid for the nomination. However, by winning this way, along with her dishonest attacks on Sanders, the Democratic Party is looking far too much like the Republicans, which could greatly suppress turnout for Clinton in the general election. While the Democratic Party leadership might get away with acting undemocratically in choosing its preferred candidate, the Republicans are in the opposite situation. Donald Trump has the lead despite opposition from the Republican leadership, which is now throwing its support behind Marco Rubio. It sure puts the Democrats in a bad light when they are rigging their nomination battle but the Republicans are leaving it more up to the voters. Whether the Republicans nominate Trump or Rubio, Sanders has the best shot of handing the Democrats a victory in the general election. Posted in Barack Obama, Bernie Sanders, Donald Trump, Harry Reid, Hillary Clinton, Marco Rubio, Politics. Tags: Barack Obama, Bernie Sanders, Donald Trump, Harry Reid, Hillary Clinton, Marco Rubio, Politics. RSS feed for comments on this post.. TrackBack URL. You know, if you're going to be in the tank for Bernie, fine, just put it in a banner at the top of the piece. And if you're going to rely on anything Ralston said, without explaining that Ralston also published instructions for how the Republicans could screw Hillary by participating in the Democratic caucuses, then you don't have a lot of credibility. Who next, Maureen Dowd? R. Emmett Tyrell? If Bernie thought he could just come in and decide to be "Democrat for a Day" and hijack a party he has never belonged to, and that there wouldn't be pushback? I'll tell you what: When Bernie, who is so above what we petty mortals do, gets honest and runs for president as a Socialist, I'll give him some credibility. Hell, when he actually raises money for Democrats, I'll listen. But that'll never happen. Because he needs the party, and because he knows he wouldn't stand a chance if he ran as what he is. That's your honest man of integrity. Screw him. The answer to this "theft" others have deemed a declaration of war against Bernie's political revolution is to declare war on the establishment. There is a banner on top of the blog: Liberal Values. It is not a matter of being “in the tank for Bernie.” I will support any liberal candidate, and I will not not a corrupt conservative like Clinton. I would rather have an independent who has caucused with the Democrats than someone like Clinton who seeks to turn the Democratic Party into a copy of the GOP. Your comment is a typical Clintonista response, following the Clinton’s three D’s–Distract (and never respond to the actual issue). Deny any wrong doing. Demonize those who disagree. Jsrtheta: "You Sanders supporters are AGAINST the Democratic Party! The Democratic Party don't want no independents! Get out, we're for long-time Democrats ONLY!" Great election strategy. You won't need any of those independents in the general, I guess. I just appointed myself the designated Republican/Conservative of this liberal blog, and as such I'd like to cut a deal. How about just for this primary cycle, the Republicans take the DNC super delegates and use those delegates to stop megalomaniac Trump and thus keep them from their current job of usurping the will of the majority of Democrats. So, any takers on my offer? Sure if you can get the parties to accept this. However I’m not sure that Cruz or Rubio would be any better than Trump. As far as I’m concerned, Cruz, Rubio, Trump, and Clinton are all unacceptable as president. I was talking to a friend on Sunday that also self-identifies as a conservative, I gave a fictitious scenario where, if we were given the "magical power" of picking the president but we could only choose between Bernie and Hillary, we both agreed without hesitation on Bernie. But wishes and unicorns aside, I looked at Nevada's total numbers of voters in the primaries. I compared it against 2008 because in 2012 there was no contest on the Democrat side. Total voters in primaries for Dems in 2008 was roughly 10,000 and total Repubs were about 35,000- As you probably know, the ratio of primary voters does not translate to general election ratios as Obama won Nevada in 2008. But what I wanted to point out was this year total dem votes was roughly 12,000 about 20% increase (population increase in 8 years?) on the Repub side it over doubled, about 71,000. Like wow, could there be that many more republicans in 8 years or is perhaps Trump pulling in people that normally don't vote. I'm not just fearful he will win the Republican primary, I'm starting to fear he may win the general election as well. If it ends up being Hill vs. T. since neither have any appeal outside their core supporters, the only way forward for either camp will be the most negative, "that one is worse than me" campaigning we have probably ever seen in our lifetimes. Clinton won the Nevada caucus in terms of caucus night but winning a caucus does not necessarily translate into winning more delegates. Turnout has been up for Republicans in primaries/caucuses. I think it is for a combination of reasons. The GOP race is getting a lot more media coverage, including Trump’s showmanship and having more Republican debates. For a long time the media covered the Republican race as wide open while they covered the Democratic race as if it was inevitable that Clinton would win. Plus Republicans are madder, having Obama in the White House, and are more likely to participate in politics earlier. It could also be the first sign of a big Republican win, especially if Clinton is the nominee.